Richard Linklater's masterpiece of a film covers a twelve year period of real time as the young actor in the his story grows up. It follows the young protagonist from the age of 6 years old until he graduates from high school. The film was shot intermittently beginning in the summer of 2002 and completed in October 2013. Just the thought of getting actors and other resources to commit to this long term project seems to be a logistical nightmare. But watching as the characters physically change and evolve while we as the audience witness the everydayness of his experience. The film premiered at the 2014 Sundance Festival and Linklater won the Silver Bear for Best Director at the 64th Berlin International Film Festival. Mason Jr. (Ellar Coltrane) lives with his mom Olivia (Patricia Arquette) and his older sister Samantha (Lorelei Linklater) in Texas. Olivia is divorced from their dad Mason Sr. (Ethan Hawke) who is a bit irresponsible hasn't seen his kids in awhile. Although he has a hard time showing it, he really loves his kids and spends the weekends with them every couple of weeks after he returns from Alaska. The kids are typical sibling teasing and fighting with each other. The scenes are small but bring significant moments like mom arguing with her boyfriend, suddenly having to move to Houston, making new friends, mom going back to school, mom getting married, new step siblings, drunken step dads and spending quality time with bio dad all from Mason's perspective. We watch as Mason grows from a cute round faced kid, to a lanky long haired teenager. Not only do the kids grow older, but the parents as well. Becoming more rounder and filled out as adults tend to do. 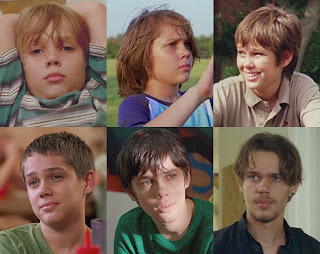 The story itself by Richard Linklater was written over the same period of time with all the major actors playing a part of the writing process. The project was akin to making a short film a couple weeks out of each year for twelve years. Each vignette is sometimes like a memory of the pop culture of the time. Olivia would read Harry Potter to the kids before bed, then in future they are attending a Harry Potter book premiere in costume. Their dad has the teen siblings put up Obama signs on people's lawns. Mason Sr and Jr discuss Star Wars. The conversations are sometimes deep and and sometimes pointless. There is something for everyone to relate to in their own life. Olivia gets her masters in psychology but can't seem to have a steady relationship. Mason Sr. manages to buckle down and become an actuary, get married and have another child. Mason discovers a gift of photography that helps him shift his usual aimless and unfocused self into young adulthood. The transitions from the moments in time are fluid and honest. As the years go by the story touches on the different traumatic events that affect the family, but then the next moment, you see everyone moving forward as life does as we bear the sadness and search for happiness in our lives. The concept of movies that have the same actors in continuing stories over the years has been explored in Linklater's “Before” trilogy of Before Sunrise, Before Sunset and Before Midnight. This time he covered the twelve years in 164 minutes of running time. It doesn't seem like it, because your attention is totally involved in the characters. The peyote brownie fueled cosmic comment at the end of the film pretty that pretty much sums it up and will leave you thinking...”yep”.